It’s been an exciting weekend at the Boyd’s. To start off with my bow has finally arrived! I spent most Friday showing off. You know practicing working on my grouping, getting comfortable with it and just enjoying the extra bonding time I am getting to spend with Nick. On Saturday we not only babysat our little niece but work was completed up at the Farm. The orchard is now mowed, and we also cleared some shooting lanes with the pole saw. The camera was also moved down to the field near the salt lick. Most importantly, a few tree stands were switched around to accommodate our new left eye dominate archer. Sunday, most of the day at the cabin clearing more shooting lanes and fertilizing the apple trees. It’s also the reason for my fancy outfit, seen above. 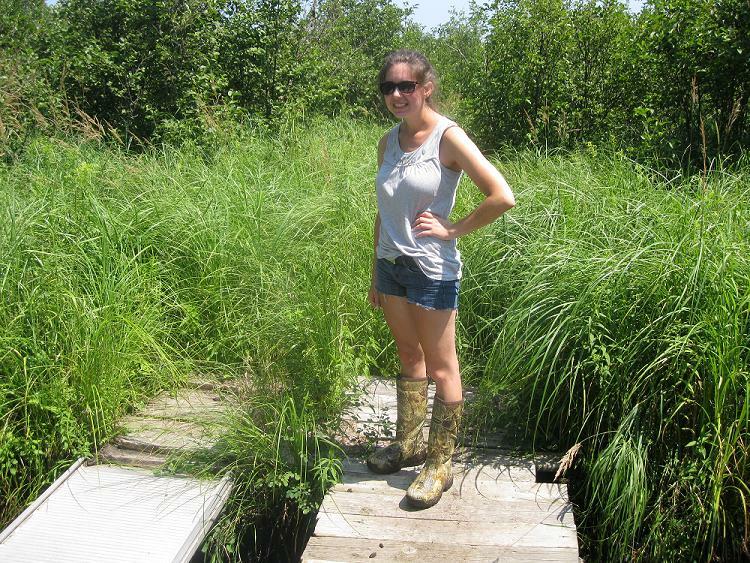 We had to walk down into the cedar swamp and I do not enjoy muck. Even though we were beyond busy, I still had plenty of time to find new blogs and read interesting articles. Here are some awesome ones that I want to share with you! 1.) A Reel Lady – Glynn has written an amazing post regarding her first experience with archery. A MUST READ for anyone. 5.) And finally over at Maximum Outdoors you can see how its okay if your fishing trip doesn’t always go as planned. This entry was posted in Weekend Recap and tagged hunting, weekend recap. Bookmark the permalink.